Come sit in the shade for a while. You never know what this old dog might hack up. On September 11th 2001 my wife and I arrived home from night shifts at a metropolitan hospital to the news that one of the two towers of the World Trade Center was burning. We followed events closely until we watched the North Tower collapse at 930, a mere ninety minutes later. After a few moments passed she asked, "What now?" "We go to bed," I replied, "we don't know what will be asked of us when we arrive at work tonight or how long it will be asked of us." With the very notable exception of our men and women in uniform, most of us are still waiting to say "yes" if asked to serve our country or sacrifice for the good of our fellow citizens. The nation is divided because we lack a common vision for a better tomorrow. We are not tackling the problems that face us because our leaders do not think us brave enough, strong enough or, perhaps, smart enough to face them. That day taught us that we are not immune to the realities or dangers of a world in motion. Very little has been done since that day to help average Americans build a stronger, more resilient union. I loved George Bush when he stood atop the rubble pile and addressed the gathered rescue workers. I cried when he encouraged women to accompany their female Muslim neighbors to the grocery store if their neighbor felt intimidated. I was proud when violence against mosques and Muslims proved an empty fear and the rare event was universally denounced. Likewise, I was never more disgusted than when I was told it was my duty to "go shopping" and return to my normal habits of consumption. I blame George Bush because he said it first and with oblivious crassness but I have heard the message repeated every time I have turned on the television or flipped through a magazine in the last decade. Ten years have passed and I am still waiting to be treated as a citizen engaged in his community rather than a consumer wrapped up in himself. Ten years have passed and our economy is just as dependent upon oil imported from nations which underwrite jihadist Islam. Ten years have passed and we are still just as engaged in a recreational economy of consumption rather than a constructive economy of service. We now have the IPod, IPhone and the IPad but we do not have a vision for making America solvent, smart, resilient and more free. The police forces of our cities may be better prepared, at least they are better equipped, but what of the nation? We are more in debt, more dependent, increasingly estranged from one another and less involved. The women and men who died that day, and those who have died or been maimed since, did not sacrifice in vain but neither have we done full honor to their memory. We owe it to them, ourselves and our children to pay off debt so that we are more free; use less oil so we are less dependent; work harder so we are more competent; work smarter so our accomplishments are useful; serve our neighbors and discover, not the media-driven conflict of ideological demagoguery, but the unity of genuinely liking one another that arises from knowing one another. 1) Being completely debt free by September 11, 2021. 2) Work at my local poll station in every election for the next decade. 3) Shop at local businesses, buying American goods, preferring products that will last longer, help me consume less or have traveled fewer miles. 4) Be useful to my neighbors, serve according to my ability, trust the person before me more than is my nature, doubt even the rhetoric marketed to me. 5) To respect you and insist upon being treated respectfully, even when we disagree. If those responsible for leading the nation will not ask it of us; it is time for us to ask it of ourselves. 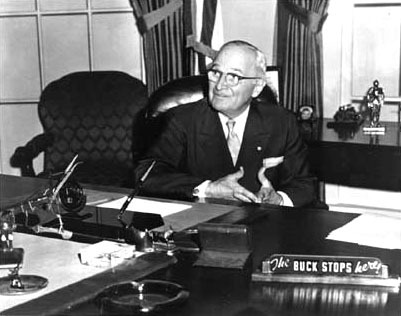 With all due respect Mr. Truman, the buck stops with me. Last edited by wisconsin_cur on Sun Sep 11, 2011 3:04 am, edited 3 times in total. Sevareid's Law: "The leading cause of problems is solutions." Thank you for your eloquence and honesty. I do not make new year's resolutions. However, I do set goals. This blog is an inspiration to me to spend this day in prayerful reflection as to one meaningful and relevant goal for 9/11 for each year to come. Because, with all due respect, wis_cur, the buck stops with ME (too).